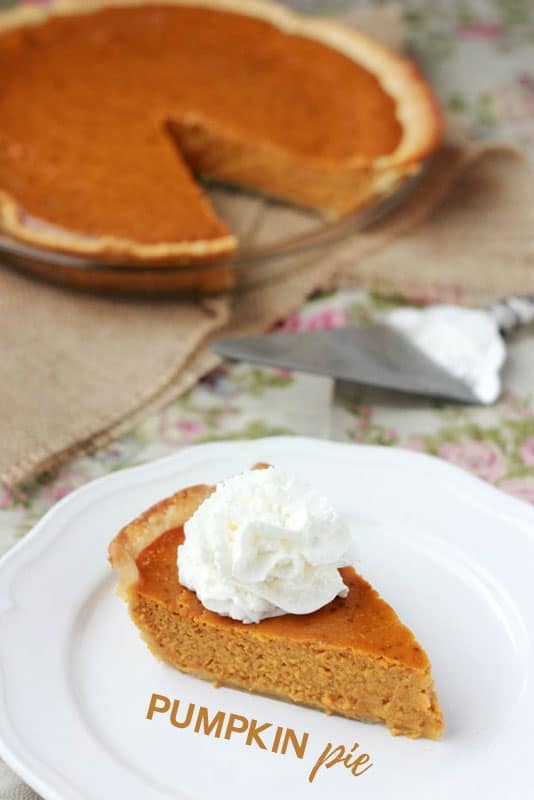 This classic Pumpkin Pie Recipe comes straight off the back of the Libby’s can and is still one of my favorites! This is THE pie of Thanksgiving for us. My Grandma used this recipe and whipped up, not one, but THREE pumpkin pies for our gatherings. They seemed to disappear just as fast as she could get them to the table. 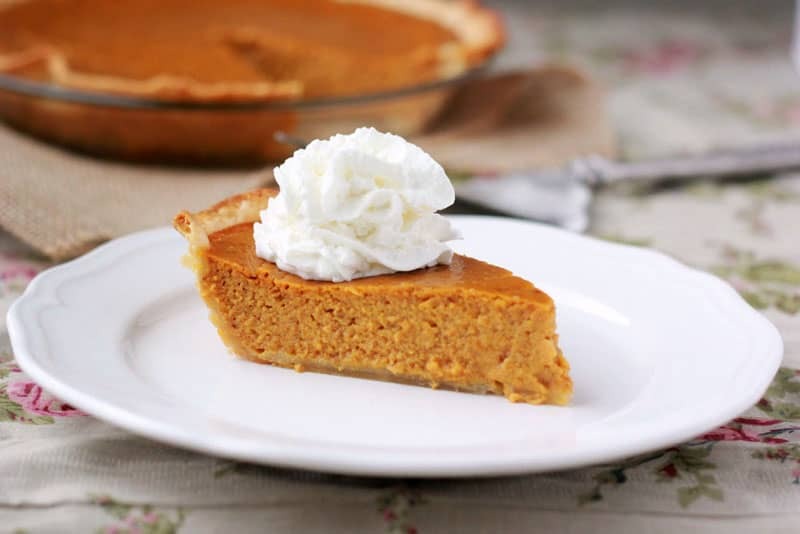 We would all reach around the apple, cherry, and chocolate, for this silky smooth pumpkin pie. It has become one we can not live without. We rotate who brings it to our Thanksgiving table, but we all use the same recipe. 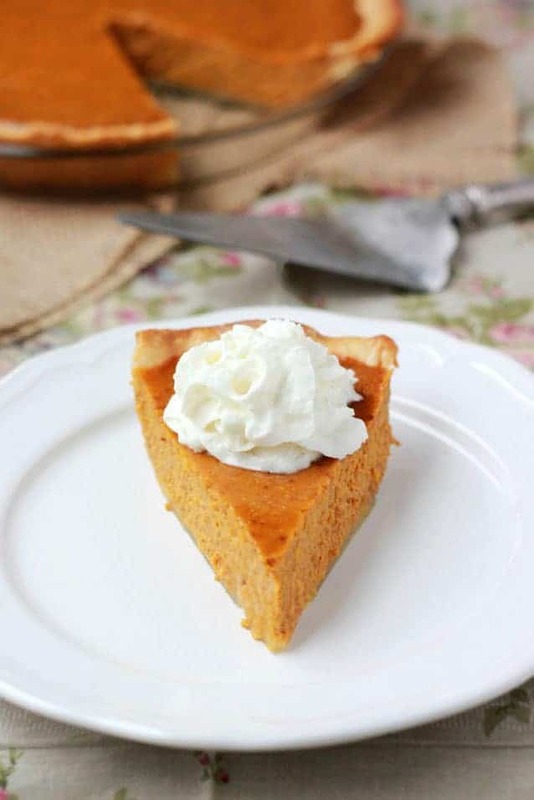 Of course, pumpkin pie is not complete without a huge dollop of of whipped cream or cool whip. Should we get into the whipped cream vs cool whip topic?? No?? And when I say huge I mean probably double the amount of pie. Am I the only person that does this?? Ooooooh OR ice cream. WHY have I never tried ice cream?? Regardless of how you eat it you’re sure to love this simple and delicious treat. Like this recipe? You will love my Streusel Pumpkin Pie, Caramel Apple Pie, and Chocolate Pecan Pie! All great options for your upcoming family gatherings! Especially Thanksgiving dinner! Whisk together the sugar, cinnamon, salt, ginger, and cloves. Slowly stir in the eggs and pumpkin. Add the evaporated milk and mix until full combined. Pour into your pie shell and bake for 15 minutes. Reduce the heat to 350 and continue to bake for 45 additional minutes. Cool and serve with whipped cream. I don’t love pumpkin pie, but I still think it’s a must. Can’t wait to try this one. My pie of choice is Banana Cream. Yum. Nice insight to your grandma making a crust less pie!! I don’t like pumpkin pie, never have. But Sean on the other hand, would DIE over this!! Maybe I’ll send him to your house for the weekend?! I love pumpkin pie. Yours looks very nice. I’m sorry you got your knives takes away. It’s really hard to cook without them. Do you have one stashed away somewhere? Crustless pie? That’s freakin GENIUS!!!! Yours turned out great! I cannot even tell you how delicious this looks! Yum! I’ve never tried making a pie before, but you are making me want to give it a try. Thanks for the pie week inspiration! Good morning. Terrific web-site. I’m wondering, though, where did you get hold of the theme? theme as terrific as this one. Thanks again. Hello there. Merely desired to inquire a rapid question. I’m setting up my own blog along with wish to learn in which you have ones design? Seemed to be that cost-free? Or maybe seemed to be it compensated? I cannot manage to come across anything at all competitive with that one, so preferably you can let me know. Appreciate it. PS, my personal apologies. English isn’t our primary dialect.